Both Zenith and Land Rover celebrate what was one of the most iconic years for both companies with the release of the 2016 Zenith El Primero Range Rover Special Edition. In the same year we put the first man on the moon, flocked to the Woodstock festival and watched the Concorde break the sound barrier, Zenith unveiled their fabled El Primero chronograph; a watch that will go on to become the companies most iconic model. In the same year Land Rover introduced a prototype of their first Range Rover; a car that would combine both luxury and Land Rovers reputation for off-road supremacy. Forty-seven years later, both companies proclaim 1969 to be one of the most influential years in their respective histories. Celebrating this commonality, Zenith and Land Rover have collaborated on a watch that pays homage to both companies trademark styling, combining class with rugged undertones. The 1969 Zenith El Primero was so important to the horological community as it was the first automatic chronograph in history – a complication that would soon dominate the watch market by sheer demand. The caliber was designed with a column wheel and a central rotor on ball bearings integrated into the single module. Being the first usually requires you to work out the kinks, but this chronograph was the first to be introduced with a movement that beat at 36,000 vibrations per hour; also making it the worlds most accurate chronograph at the time. With a 50-hour power reserve and a 6.5mm thick by 29.33mm diameter case, it is easy to see how this piece found its way into the history books. Zenith shared that the El Primero and Range Rover crossed paths early in their history “when explorer John Blashford-Snell crossed the Darién Gap – an inhospitable marshland and virgin forest area on the border between Colombia and Panama – at the wheel of an early Range Rover and with an El Primero chronograph on his wrist”. Since 1948 the British car manufacturer Land Rover were known for their superior 4×4 capabilities. With ambition to create a new market for the all-terrain vehicles, the Range Rover was born. The 1969 Range Rover housed a 3.5L V8 petrol engine, coil springs, permanent four-wheel drive and luxurious leather interior; making it the first luxury 4×4. The 2016 Zenith El Primero Range Rover Special Edition, which will retail for 7,900 Euro, pays homage to its heritage beating at 36,000 vibrations per hour, a 50 hour power reserve and the in-house El Primero 400B movement. The central hours and minute hands hover above the chronograph which measures up to 1/10th seconds. The movements rotar is inscribed with Range Rover and can be seen through the sapphire crystal case-back. At 42mm, it is slightly bigger than the original, but such is the demand from the market – and so are the Range Rovers. 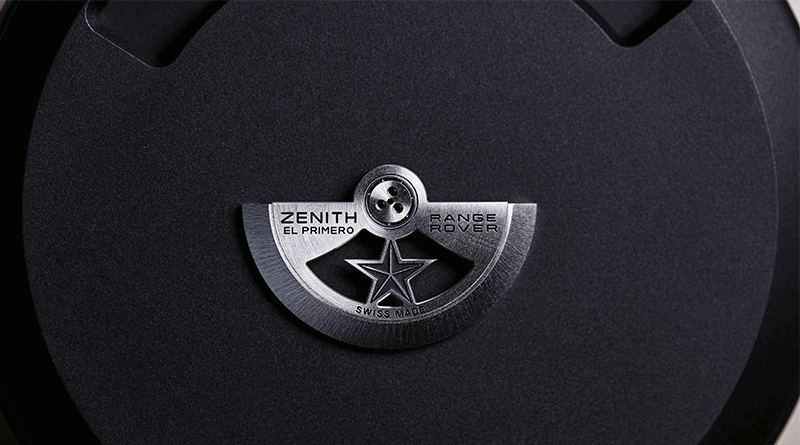 The press release from Zenith states “…Zenith is presenting the first exclusive El Primero Range Rover Special Edition…”, indicating this is just the start of the partnership. Being so close to the 50 year anniversary of the releases, we foresee 2019 being a suitable release date for another special edition.